Each project begins with a list of required tools and components, followed by the instructions, full sketch, and circuit board templates for the build, as well as directions for building a permanent enclosure. You’ll even find the author’s design notes, which are sure to provide inspiration for your own inventions. 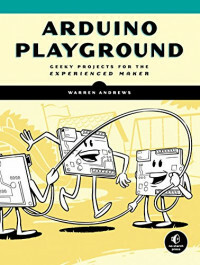 Gather your parts, break out the soldering iron, and get ready to take your Arduino skills to the next level with Arduino Playground. Uses the Arduino Nano and Pro Mini boards.